It is said; “when one door closes, another one opens.” But to Shirlene Nafula, it’s all about picking up the pieces from disappointment and journeying through the window of opportunity towards your set goals. The 26-year-old was once confronted with the misfortune of losing out on an opportunity to pursue her higher education in the UK. Today she is leading the growth of a promising business that has attracted the attention of an investor and Kenya’s head of state. Intriguingly, the business was conceived during tempting times. It was in 2014, Nafula had successfully graduated from the University of Nairobi with Bachelor of Science in Microbiology and Biotechnology, then applied for masters in Kings College, and the London-based institution had accepted her application when disaster stroke. Her family was unable to raise the required finances to pursue this course. This led to the delay of visa and she eventually lost the opportunity. To make matters worse, she had at the time quit the mushroom cultivation project she was undertaking. She took a thorough independent analysis of the business’ commercial viability, and with a thumbs up from her mom, she opted to give it a try. “I approached one of the reputable professors specialized in Biotechnology from one of the renowned universities locally, who took me through standard formulas of making, testing and modifying the products,” she says. 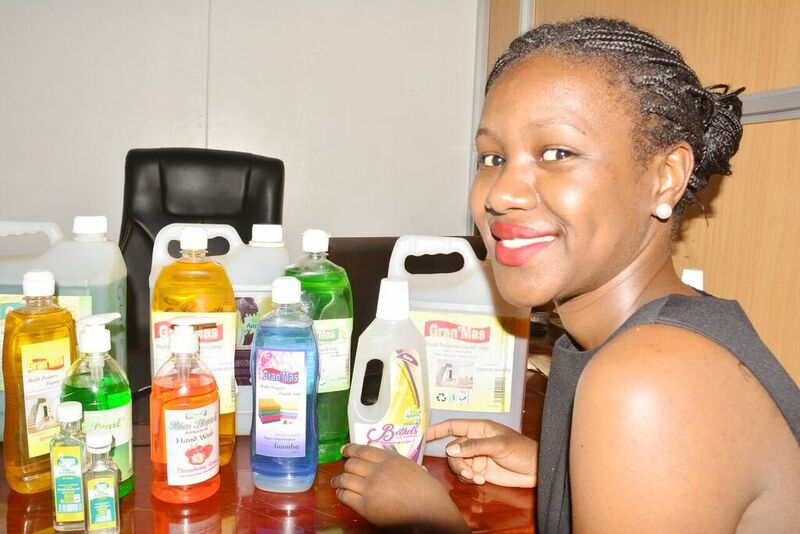 And with about KSh10, 000 capital partly raised from her mother and grandmother, Nafula bought packaging bottles and the chemicals, giving birth to Crystal River Products in October the same year (2014). The business manufactures bio-based beauty and clean care products for personal, household and corporate use. Their registered trademarks are Bio Pearl, Gran’ Mas (named in appreciation of her grandmother), 7 degrees, Bethels, Shanea and Fab Soft. The firm is currently licensed by the Kenya Bureau of Standards (Kebs) to market four of these products; from a range of more than 20 others still undergoing standardization tests. Crystal River Products also offers cleaning and maintenance services in partnership with Rene Super Clean services. To improve on distribution, Nafula has hired about 10 employees, who she’d pay from the proceeds made after selling the products. However, being a startup trying to build a name in a competitive market, the model failed a few months later. “The sales team wasn’t productive enough to bring in sales to support their salary. So it meant pilling debts on debts to ensure they got paid. Soon, I was broke and contemplated shutting the business,” she says. She laid off the entire staff in a bid to cut down on expenditure, at some point missing out on lunch and certain crucial needs to buy chemicals and other equipment for the business. The turnaround strategy, she reckons, included hiring new staff on an ‘incentivized model’; where each was to be paid commission on the sales made. This model, she says, has enabled her business to grow to its current stature. Today, Crystal River Products employs about 20 staff, who targets the middle and low-income earners in Nairobi. The business has grown mainly in the slum areas, where sanitation, according to a 2014 UN-Habitat Post-project intervention assessment report on Kibera, is acknowledged as a major challenge. On the other hand, the beauty products are a household name in major salons and beauty parlours in most Eastlands settlements of Nairobi. “This is mainly due to the relatively affordable prices of our products, which rate at between Sh130 and Sh170 (for the 500ml Bio pearl hand wash) lower than the Sh200 and above charges placed by other companies,” Nafula says. It is such small-scale production, Nafula says, her firm embarked on a mission to lobby for finances for its expansion. The entrepreneur sought an investment worth Ksh4.5million from the Lions (venture capitalists), in exchange for 10 per cent equity. This would enable her to upgrade the business’ production capacity, improve distribution and enhance marketing. She managed to convince Darshan Chandaria, Director and Group Chief Executive of Kenyan conglomerate Chandaria Group, who accepted to invest an undisclosed amount of venture capital into the business, in addition to guiding it through the requisite growth curve. “I was looking for support that was more than just finances; a muscle that would assist the firm’s marketing, public relations and strategic growth and development. I’m happy the new investor could pump in the fresh breath into the business,” Nafula says. Four years since founding Crystal River Products, many gateways have opened up for Nafula that most jobs wouldn’t have. She’s had roundtable meetings with ministers, CEOs of big corporations and media professionals. She’s also been listed among Top 40 under 40 enterprising women by Business Daily newspaper for her creativity and focus in business. To cap it all, she was one of the only two innovators picked for Kenya Airways inaugural flight to the United States late October, courtesy of a presidential complementary ticket. The trip enabled her to hobnob with some of Kenya’s top dignitaries, offering the rare opportunity to share impactful economic ideas. With such milestones covered, Nafula now hopes to see the company become the leading producer and supplier of the best bio-based beauty and cleaning products in the region. She also wants to see the business create an impact on Kenya’s economy, largely reducing the increasing youth unemployment by creating more job opportunities for the young people.